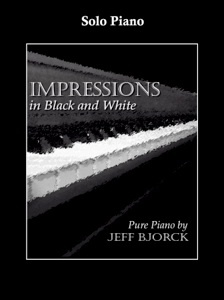 Impressions in Black and White is the companion e-book to Jeff Bjorck’s 2005 CD by the same name. All eleven pieces from the album are included, with note-for-note transcriptions by Rebecca Oswald that I proofed. 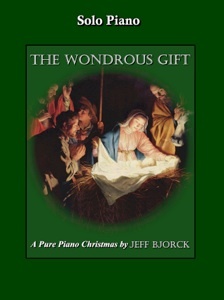 As is his custom, Bjorck included his arrangements of two classic hymns and the other nine piano solos are original compositions. None of the pieces are overly difficult, but most are not easy, either. I would say that they range from upper intermediate to early-advanced, but with some practice, most pianists should be able to master these pieces without much problem. There are only a few reaches of more than an octave and none of the pieces are in difficult keys. Expression, metronome settings and pedal suggestions are included as per Bjorck’s recording. 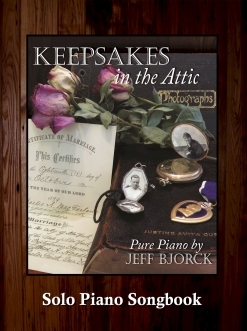 The sheet music for many of these pieces was released as individual downloads over the past several years, but this is the first time the full collection has been available as an e-book - a more economical option. Rebecca Oswald always does an outstanding job of making transcriptions as close to the recordings as possible, and this book is no exception. The notation is clear and easy to read, making this collection a pleasure to play. 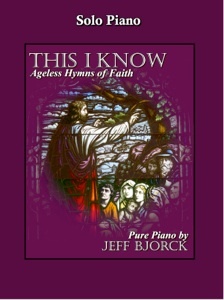 My own favorites are Jeff’s arrangement of “Be Still My Soul” and his “Walking with Tevye” and “Return to Catskill Meadow.” The e-book is available from www.purepiano.com. Recommended!